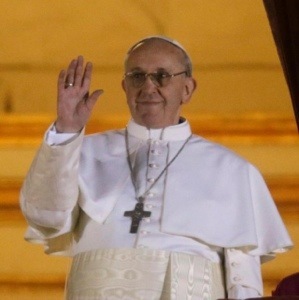 VATICAN CITY, March 13, 2013 (Zenit.org) – Here is a translation of the brief greeting Pope Francis gave from the central balcony of St. Peter’s Square following his election as the Successor of St. Peter. VATICAN CITY, March 13, 2013 (Zenit.org) – According to the director of the Vatican press office, Pope Francis has spoken with his predecessor and they hope to meet in the coming days. Jesuit Father Federico Lombardi briefed journalists within an hour after Francis gave his first apostolic blessing to the faithful. Among the information given by Father Lombardi was the news that the Pope had spoken with Benedict XVI and that the two hope to meet in the next few days. Fr. Lombardi also announced that Francis will meet with the cardinals (electors and non-electors) on Friday morning. The next day, Saturday morning, he will meet with journalists. The Mass for the inauguration of his pontificate is scheduled for March 19, next Tuesday, the feast of St. Joseph.